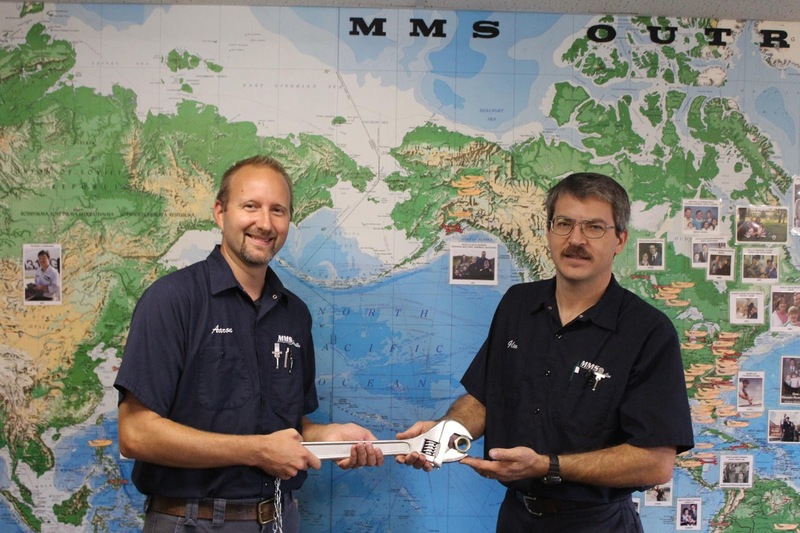 It's been a long ten weeks since I earned my A&P mechanic certificate at MMS Aviation. During that time, we took a much-needed family vacation, got stranded in Kansas for eight days, visited churches and ministry partners, sorted and purged our belongings, started packing our house, and went to North Carolina to find a rental home. This transitional period has been a bit trying for our family, so we are happy to report that we finally have a move date! On December 5th, we will begin loading the moving truck, and we plan to be moved into our house in Burlington on December 8th. 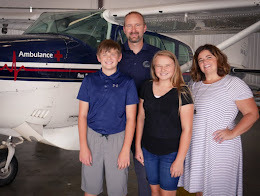 We are excited about what's happening at Missionary Air Group, and are looking forward to being the first apprentice to go through the flight training program at their headquarters in Burlington, North Carolina. Not only is this a big step for us, but we are also paving the way for future missionary pilots who will be trained through MAG. 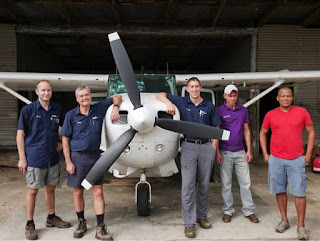 You may recall from our previous posts that we are helping to pioneer a new method for training missionary pilots, which overcomes some financial hurdles and lack of experience that keep many prospective missionary pilots from reaching the field. We appreciate your prayers for our family as we make the transition to North Carolina. During our house hunt we faced a large discrepancy between our expectations and the reality of the rental market in Burlington. We've mostly worked through this shift in expectations, but appreciate your prayers as we adjust to a smaller living space and the lack of outdoor space that we are accustomed to. We've already been thinking of ways to embrace the change, but I'm sure it will continue to be a challenge at times. That said, we are thankful that the owners of the house in Burlington have already begun to help in this regard. The kids will also be making the transition from home schooling to a Christian school in Burlington. Although we love the flexibility of home schooling, we believe that the Christian school is the right place for them to be for this season of our lives. Ian is very excited about going back to school outside the home, while Ella is a bit hesitant. We've had a very irregular schedule these past several weeks, so it will be good to get back into a routine, but it may be a challenge for them as well. Finally, we are praying for a few additional ministry partners to join us as we begin serving and training with MAG. The cost of living in North Carolina will be higher than living in Coshocton, so we are looking to increase our support level by a few hundred dollars per month. If you're not currently partnering with us and would be willing to prayerfully consider it, please read more about how you can be involved. We are grateful for all of you who have come alongside us on this journey, whether through your friendship, prayers or giving to our ministry. We look forward to sharing the ways that God continues to lead and work in and through our lives over the next couple years in North Carolina. Last week, Ian and I had the opportunity to travel to Clendenin, West Virginia with a work team from Burt Avenue Wesleyan Church in Coshocton. 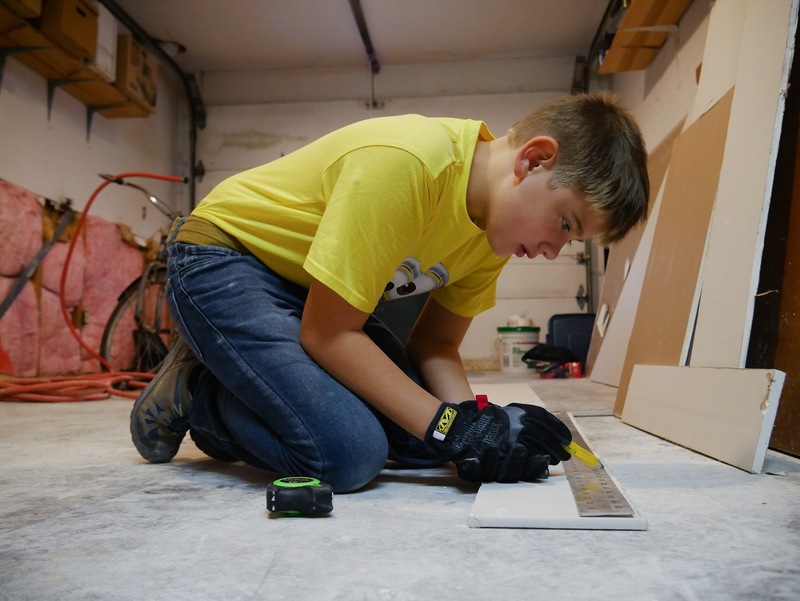 Although the timing of the trip was not convenient (we are preparing to move to North Carolina), Ian expressed interest in participating and I wanted to be supportive of his desire to serve. I'm glad we decided to go! 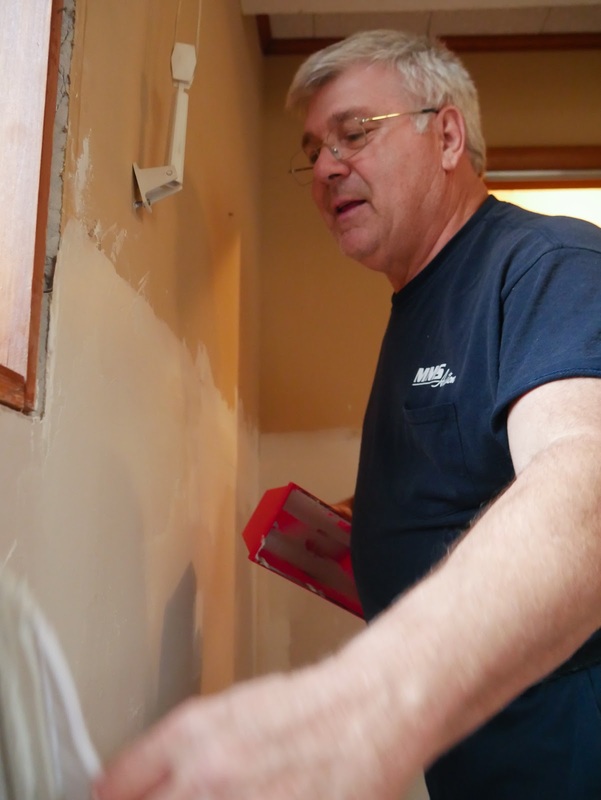 We spent four days installing new drywall for a woman named Barbara, whose mobile home was destroyed by the recent flooding in Clendenin. 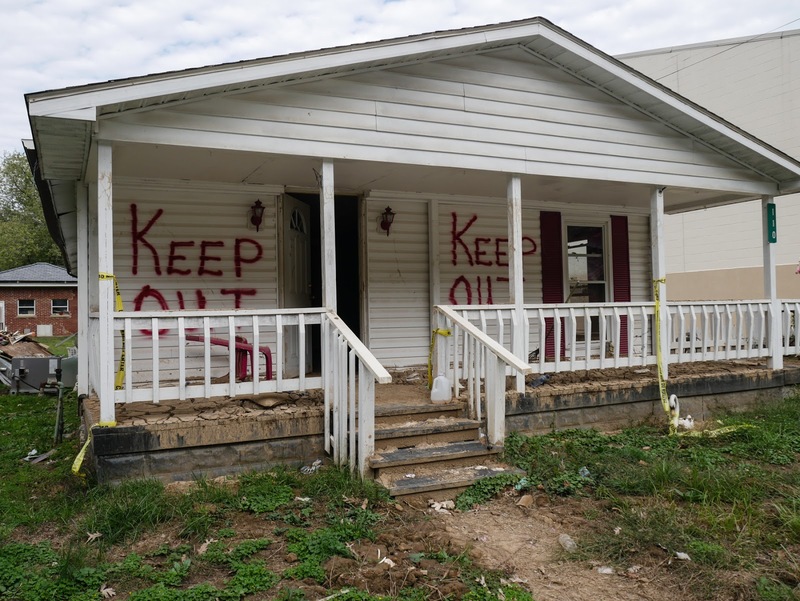 She came into possession of another home, but that house had been damaged by the flood as well. Previous volunteers had cleaned up debris from the flood and cut off about four feet of drywall that had been damaged. 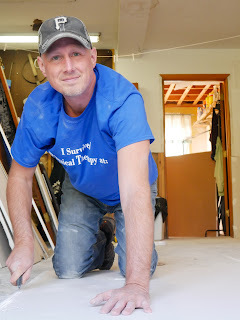 Our job was to splice in new drywall, and to tape, mud and sand as much as possible. Among other skills, Ian learned to cut openings for switches and outlets. Before too long, he could measure and cut all by himself. 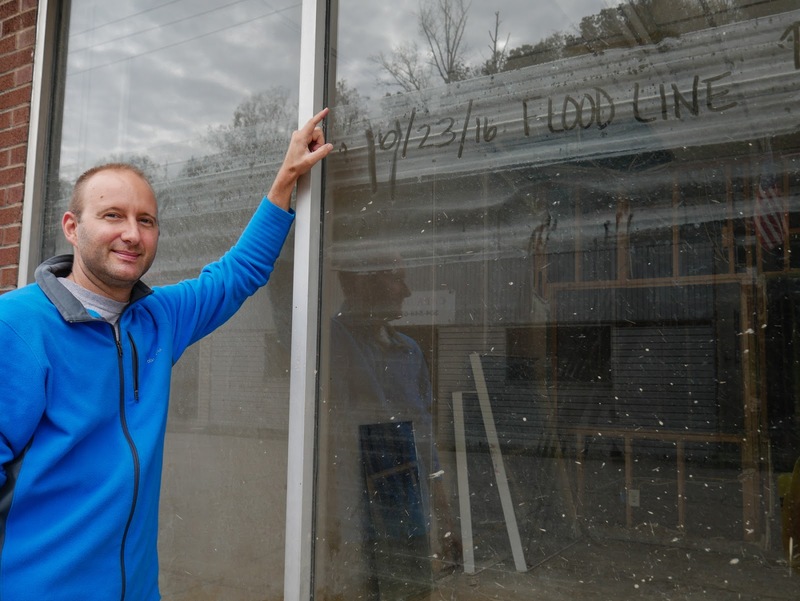 It was almost unbelievable that the relatively mild river flowing through Clendenin could rise to high enough levels to cause such damage. The normal level of the river is more than twenty feet below street level, but during the flood the water level rose about seven feet above the street, as shown in the photo below. 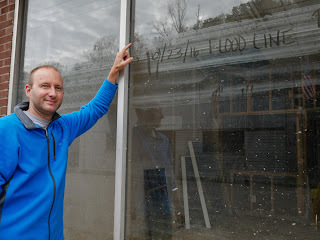 The water level can still be seen on this storefront window. Many houses had been cleaned up, but some were still in very rough shape. It was a privilege to spend a few days serving Barb, helping her establish her new home in Clendenin. I also enjoyed working alongside Ian, serving together. I was extremely proud of Ian: how hard he worked, how much he learned (by the second or third day he could measure, cut and hang sections of drywall on his own), and how he stepped outside his comfort zone to connect with the rest of the team. 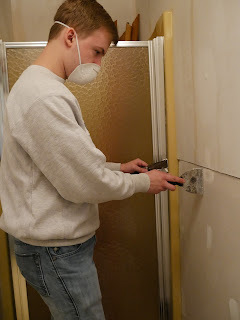 Ian and I spent much of our time working on drywall in the bathroom. We enjoyed spending time together, as well as working with the Burt Avenue team, some of whom are pictured below. 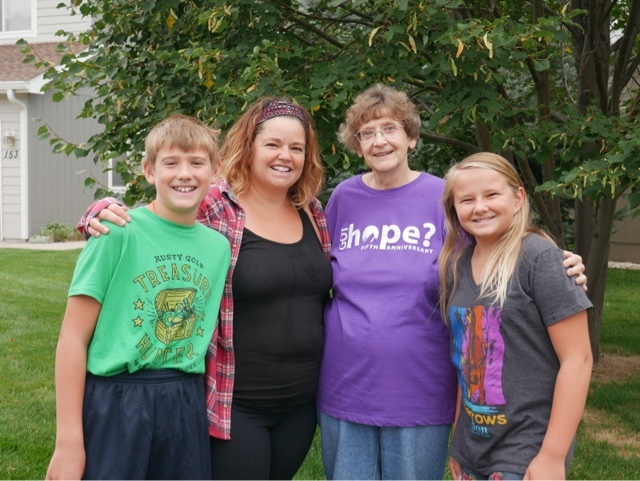 Even though our family is in "full-time" mission service, it was nice to do something different, meeting a tangible need for someone who desperately needed our help. 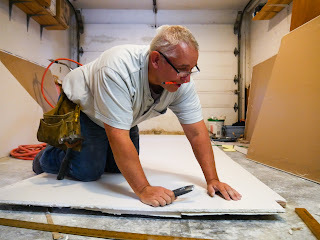 Spank is cutting a sheet of drywall. 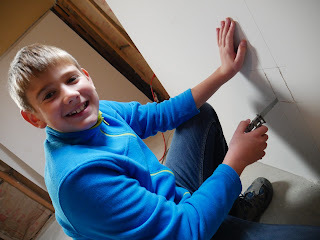 Austin was the resident "mudder", covering the screws used to hang the drywall. Mike Garrett (who also serves with MMS Aviation) was our primary "mudder". 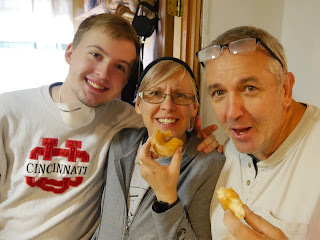 Austin, Tammy and Spank enjoy a donut break. The multi-talented Pastor Rod Uhlig, cutting a sheet of drywall. After eight days stranded in Kansas and two days of driving, we finally arrived home early Sunday morning! We attempted to leave Kansas last Wednesday evening, but the new engine in our Vibe stopped running before we got on the interstate. By early Thursday afternoon, the mechanic had the problem figured out and we were on the road again. Everything was going smoothly until we heard a "pop" from the trailer. Fortunately we were very close to the hotel in Salina, Kansas where we were going to sleep that evening. When we got out of the car and looked at the trailer, Tara and I started laughing hysterically. What else could we do? This is what we saw when we got out and looked at the trailer. 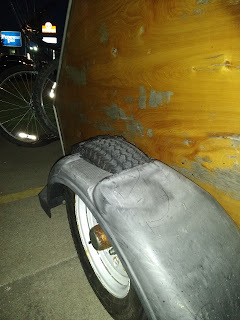 The leaf spring had broken, allowing the wheel to rub through the fender. At this point, all we could do was laugh—otherwise we might cry! The last thing we needed was another delay. But we were safe and had a functional vehicle this time! 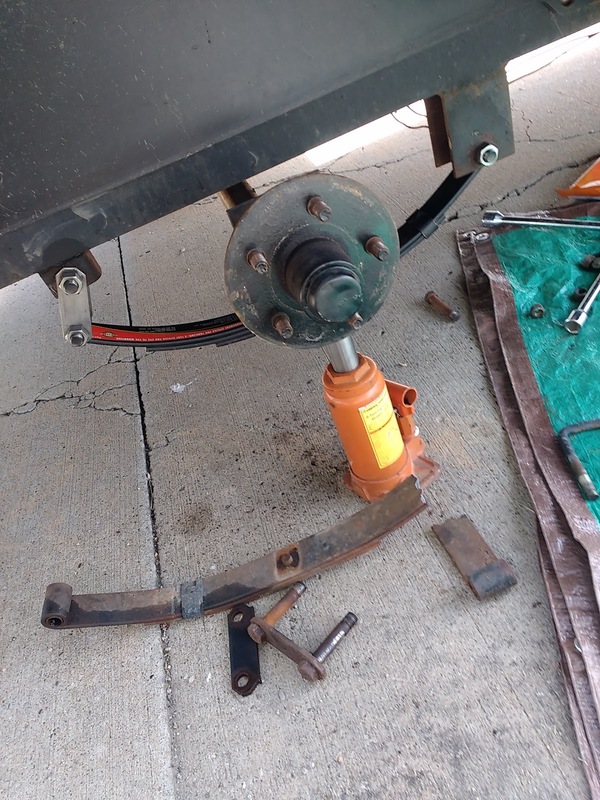 In the morning I located a Tractor Supply and a Lowe's, and got to work replacing the broken leaf spring on the trailer. It took longer than I hoped, as I ran into some unexpected snags, but by mid-afternoon Friday the trailer was rolling again and we were on our way. After one more hotel stop, dinner with friends in Indianapolis, and a final push through midnight, we arrived home! It never felt to good to drive into Coshocton! This has been a long trip, and one that we won't soon forget. We are thankful that even through trials and hardships the Lord has been with us, providing our needs every step of the way. Friends and family have responded with incredible love and generosity over the past couple weeks, supporting us spiritually, emotionally and financially. At some point, I will share some photos of the time we spent out west. Until now, the first three weeks of our trip have been overshadowed by the events of the last two weeks, but we don't want to forget about the incredible beauty of God's creation that we experienced on this trip. Until next time, goodbye! When I wrote the post entitled Ups and Downs, Part 1 I thought our car situation would be the biggest challenge of this trip. I planned to focus on the ways in which God has blessed us and provided for us here in Goodland, Kansas. I'll still share those things, but I also have some sad news to share. If you don't have time to read this entire post, you can skip the next four paragraphs and go right to the fifth. As I mentioned previously, our car broke down last Thursday afternoon shortly after crossing the border into Kansas. We called State Farm for roadside assistance, and while we were waiting for the tow truck to arrive, a pickup truck pulled off to see if we needed help. As it turns out, he worked for a local repair shop. Of course he wanted us to have our car towed to his shop. But the tow truck driver also had a shop (which the pickup truck driver tried to discredit), and the insurance agent found a third shop. Needless to say, the situation was getting very confusing and we had no idea who to trust in this small town where everything and everyone was unknown to us. I made the best decision I could based on the circumstances, rode back into town, and started calling hotels to find a place to sleep. Super 8 was full. Comfort Inn was booked. Sunset Inn: no vacancy. Same with Holiday Inn Express and America's Best. Finally, I called the last and cheapest hotel in town, which had horrible online reviews: the Goodland Motel 6. I breathed a sigh of relief when they said they could give me a room. Prepared for the worst, we got a ride to the motel. When we opened the door we found the room to be small and basic, but recently renovated and surprisingly clean. Apparently the motel had been shut down and just recently reopened under new management, which is the reason they had vacancies when every other hotel was full. I've never been so thankful to have a safe place to lay my head! Before going to sleep, we contacted everyone we could on social media in an attempt to connect with someone in northwest Kansas who could help us, but to no avail. In a last-ditch effort, I looked up a few local churches and contacted them by email or voicemail, praying that someone would be moved to help us. I know that churches get lots of requests for help, sometimes from scammers, so we were praying that someone would believe us enough to respond. At this point I was just asking for transportation to help us buy food and to attend church on Sunday, and a possible recommendation of a trustworthy mechanic. 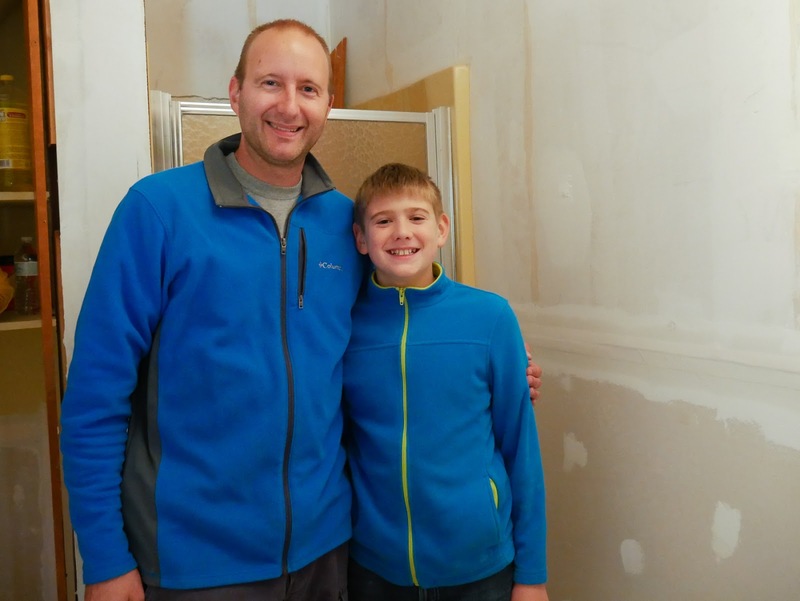 The next morning we got a call from Pastor Tim Bonebright at Goodland Bible Church. He had received our email, checked out our blog and determined that we had some credibility. After hearing about our situation, he offered to drive us to the store to pick up some groceries, and to take me to see his mechanic for a second opinion on our car. It turned out that Pastor Tim, his family, and his church were a much greater blessing to us than we ever could have hoped. Not only did they help with our groceries, but they welcomed us into their house and shared several meals with us over the course of the next few days. The church even helped to cover most of our hotel costs. It might have seemed like a small thing, but to us it was huge! And as for the mechanic, it so happens that Pastor Tim has a good relationship with Butch, the tow truck driver who pulled our car off the highway. He is currently working on replacing the engine on our Vibe, so please pray that he will be able to work quickly and proficiently! When God brought Pastor Tim and his wife Sarah into our lives (or us into theirs, depending how you look at it), none of us had any idea that they would share with us one of the most difficult nights we have faced as a family. On Saturday, September 24, Tara was not feeling well. By early evening, it was clear that she needed to get to a hospital, and though Tara didn't say anything to me in front of the kids, I knew that something was not right with the baby. 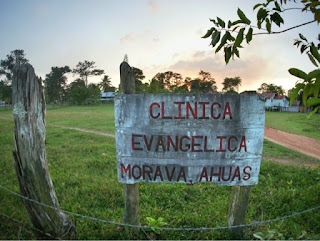 I called Pastor Tim, and he got us to the local medical center as quickly as he could. The next couple hours were very difficult, especially for Tara. She was essentially left alone to deliver our son 16 weeks into the pregnancy. The nurses did not know how to help her and I was bouncing back and forth between her and the kids. Anyone who has had a miscarriage knows how difficult it is, and as her husband I won't try to explain what Tara was (and is) going through. As a father, the most difficult moment was telling Ian and Ella that they would never meet their baby brother on this side of heaven. As we looked upon the tiny body of my son—with his ten little fingers, ten perfect toes, and his little nose and mouth—we couldn't help shedding tears together. Yet, we know that the Lord is good, and that because of the hope of resurrection and eternal life we may someday meet Ezra Ray Hammitt (or "Bean", as we affectionately called him) face-to-face. When we got stranded here in Kansas we had no idea that we would face the loss of our unborn child in addition to a major car repair bill. But God, in His grace, did not allow us to be alone. By bringing the Bonebright family and the members of Goodland Bible Church into our lives, he provided physical and financial assistance, fellowship, and encouragement to help us through this difficult time. At the same time, we have felt a great outpouring of love and prayer from our friends and family back home and around the country, who have been supporting us by phone, social media and prayer. As I conclude this post, I do want to thank Pastor Tim, his wife Sarah, and the members of Goodland Bible Church, who went above-and-beyond to help us while we were here. Pastor Brian from Harvest Free Church also checked in periodically to make sure we were taken care of and helped us explore the option of purchasing another vehicle. I know that neither of them helped us in order to receive recognition, and I am not thanking them publicly to puff them up. I'm convinced that they do not desire recognition for themselves, but they would desire Jesus Christ to be glorified and lifted up through them. So, even though we want to thank these men and women, we ultimately give thanks to our God and Father, who brought us together in Goodland. We don't always understand His plans and purposes, but He used the circumstances of his past week to increase our faith and trust in Him, and to remind us that He loves and cares for us at all times and in all places—even Goodland, Kansas! Sitting here in the hotel in Goodland, Kansas, I have lots of time to think and reflect on the happenings of the past week. I plan to write a post covering everything that's taken place, but I'm going to save that for another day. What I'm thinking of today is God's provision and what it means to trust in Him. Specifically, I've been pondering the subtle difference between trusting in God and trusting in his provision. As I mentioned in my last post, we are currently stranded in northwest Kansas, facing some costly repairs to our car. One of my first instincts was to contact MMS Aviation (the ministry we serve with, and who processes our monthly financial support) to get a digital copy of my financial statement for September in order to see how much money came in for us this month. In fact, near the end of every month I tend to get a bit anxious to see our financial statement. If it's a "good" month, I breathe a sigh of relief and thank the Lord that we won't have to be quite as frugal; if it's a low month I start thinking about how to tighten our budgetary belt. I know that God has always provided for our needs (financial and otherwise), and that every good thing comes from Him, but I also like the assurance of having money in the bank to know that we're covered financially. It's not that I don't recognize those dollars in the bank as God's provision, but I'm beginning to question whether I've truly been trusting the Giver and Provider, or trusting in the resources He provides. So this month, instead of requesting that financial statement, I decided to pause, to wait. I knew that if I looked at our income for the month, I would start crunching the numbers, filling in my budget, figuring out how to make ends meet and how to start rebuilding our savings for the next rainy day. By delaying that process, I am able to focus on the God who provides our needs and truly trust Him, rather than focusing on dollar and cents. I've always known intellectually that it's ridiculous to trust in a savings account, and that it only takes one crisis to wipe out years of savings. I've told myself and others that my faith is not in my savings, but in my Lord who provides for me. And until these past couple weeks I thought I was truly living out that belief. But ever since I worked in the corporate world, our family has had a financial safety net large enough to absorb any financial challenge we've faced. But as I watch this safety net shrink, my response to financial challenges has changed from "Thank the Lord that He's provided the money to cover this expense" to "Thank the Lord, who provides for our every need." It is a subtle change, but a significant one. The focus has shifted from the provision itself to the person who faithfully provides and cares for me. It's wise to save for the future. It's wise to plan for the unexpected. But it's easier than I realized for my security to become wrapped up in the Lord's blessings (whether it's savings, investments, a stable job, or any other good thing) rather than in the Lord Jesus Himself! It's a good time for me to learn this lesson, as we prepare to move to North Carolina. We have a lot to trust Him for in the near future, and in the midst of it I will strive to keep my eyes fixed not on the things that God provides for us, but on my Lord, my Savior, my Redeemer, and my Provider. Since it's been a while since our last post, I'll attempt to cover a lot in this one. The last several weeks we've had some significant ups and downs. On a positive note, I completed my oral and practical examinations and earned my Airframe and Powerplant Mechanic certificate on August 30! We are now cleared to move to Burlington, NC to begin serving and flight training with Missionary Air Group. I will be continuing to gain maintenance experience by helping to maintain MAG's fleet of airplanes, while receiving flight training to prepare me for overseas service. After gaining the necessary flight experience and ratings in North Carolina, I will spend some time on the field in Honduras and/or Guatemala. 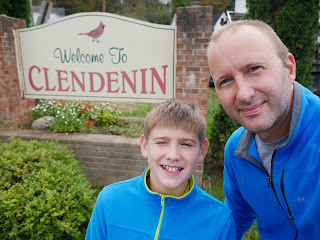 Since we have a bit of time to make the transition to Burlington, we are spending a few weeks to do some traveling and support raising to cover our increased cost of living in North Carolina. We started out by spending a long Labor Day weekend camping with my parents and my brother and his family. 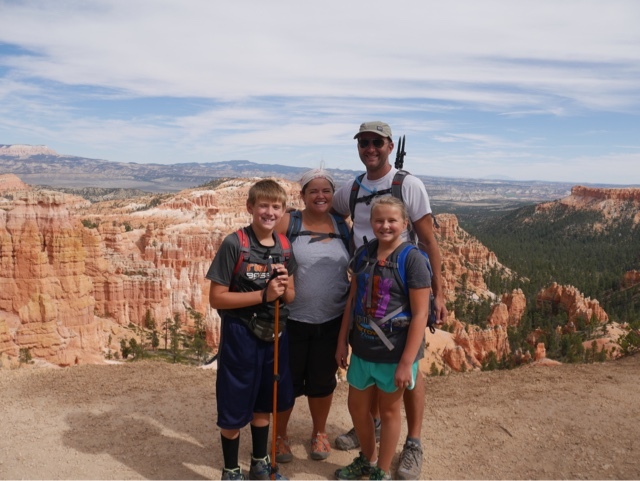 Then our family of four headed west to visit some national parks, with the intention of visiting friends, family, and ministry partners on the way back to Ohio. We had a great time visiting the Painted Desert, Petrified Forest, Grand Canyon, Zion National Park, Bryce Canyon, Capitol Reef, and Arches National Park. Finally, we crossed the mountains to see Tara's grandmother in Colorado, where we had a great visit and spent the night. Our car did well through the whole trip, until we crossed into Kansas the next day. This is where the major "down" of our trip took place. About 20 miles into Kansas, the engine started making some disconcerting sounds, and I immediately pulled to the side of the road. 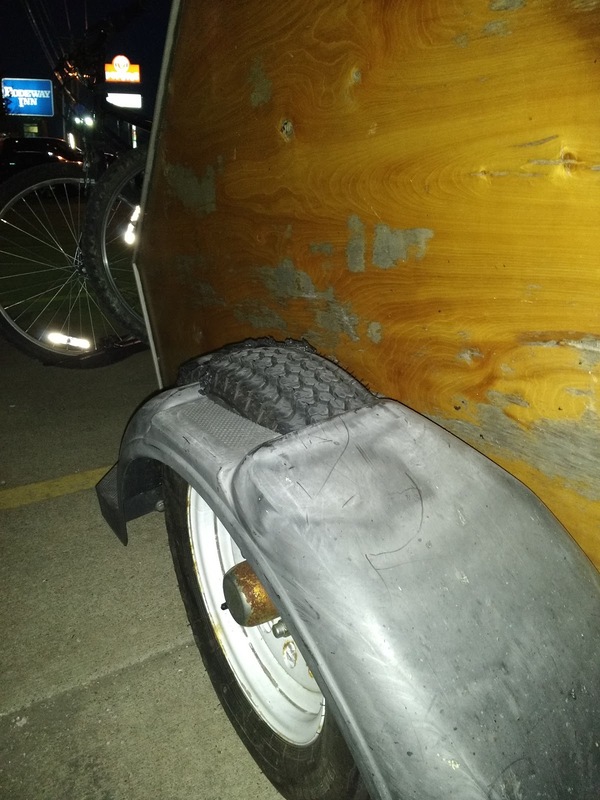 We ended up getting a tow to a local shop, where my fears were confirmed. At 190,000 miles, the engine in our car is finished, requiring replacement or rebuild. This is certainly a test of our faith and trust in the Lord! There is nothing like being stranded in rural NW Kansas, knowing no one, being at the mercy of a mechanic you know nothing about, facing a $2500 repair bill and $400 in hotel costs. In the midst of this trial, however, God has been gracious to us. I'll write more about that in the next post. But for now, we appreciate your prayers for our situation. Given the choice of buying another car here in Kansas or putting another engine in our Pontiac Vibe, we've decided to repair the Vibe, which would be essentially worthless as a trade-in in its current state. We also don't want to take out a loan to make a purchase under pressure, and we already have the money in savings to pay for the repair. However, the repair will take several days, which means we are stuck in a hotel until early next week or later. From an earthly perspective, this couldn't have happened at a worse time. We already have many expenses on the horizon with our move to Burlington and financial costs associated with Tara's pregnancy. We were also planning to draw from our savings to purchase another car to accommodate our third child, who is due to be born next March. I'd be lying if I said we haven't struggled with discouragement over the last few days. Yet, in the midst of anxiety and feelings of helplessness, I have been reminding myself of the truth that God is our provider. Even as we watch our savings account being drained, we know that we serve a God who holds the world in His hands, and for whom money is no concern. For the most part, my anxiety has turned to peace, knowing that God will—and already has—taken care of us. We look forward to seeing how He will continue to provide over the next few months. I'll share in the next post some of the ways that the Lord has already met our needs here in Kansas. After being relatively settled in Coshocton, Ohio for the last 2-1/2 years, it's time for our family to make another big transition! Last Friday I completed my time in the hangar at MMS Aviation. Now I'm studying for my exams, and plan to be a certificated Airframe and Powerplant mechanic by Labor Day. I've officially handed over the "Senior Apprentice" wrench to Glen! The next move is to North Carolina, where I will focus on flying with Missionary Air Group, while continuing to support their field programs through maintenance on their airplanes. I'm especially familiar with one of MAG's Cessna 206s, because I've spent a lot of time with it at MMS Aviation! When I left the hangar last Friday, the airplane was nearing completion, but it is still in need of one big item: an engine. 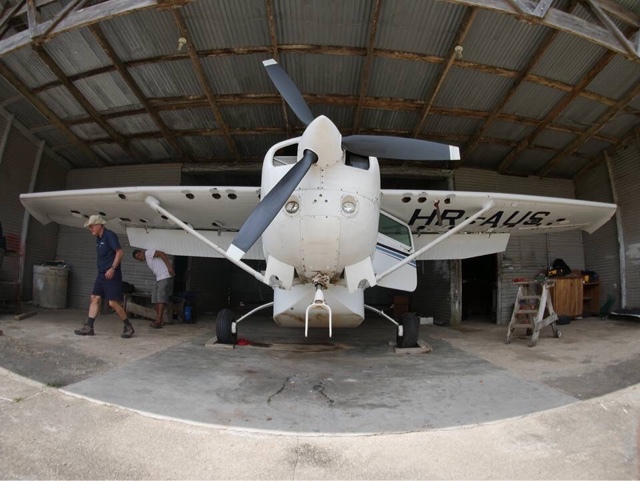 We're praying for a donor to purchase and engine for this airplane so it can get to the mission field. Here's a photo of me with N382MG as I left it. 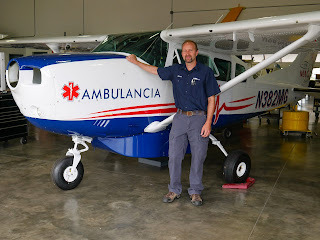 I hope to get another photo with this airplane on the field, where it will be used to bring "Help and Hope by Air" to those in remote parts of Guatemala. We are looking for affordable housing. We would like to move in September or October, but are trusting the Lord's timing. We're shopping for a new car. Our Pontiac Vibe has served us well, but as our kids grow, the car seems to be shrinking (especially with all the traveling we have to do). I'm preparing for my exams, planning to take the written test in a couple weeks, and the oral and practical exam on August 30. We need wisdom regarding schooling decisions. The stress of moving could be hard on our family, but we pray that it brings us together rather than driving us apart. It's difficult to leave friends behind. Please pray for us as we move on to a new place where we know few people, and leave friends in Coshocton. To all of you who support us in any way: THANK YOU! We truly couldn't follow this crazy, rewarding, challenging, exciting path without you! As you can see, I don't update our blog frequently, but I also post on a Facebook page, and send out a quarterly newsletter (sign up here). If you haven't seen it yet, here is a link to our latest newsletter. You'll find a few more photos and details of our plans, as well as some things that God has been teaching us lately. Over the past few weeks I've had two interactions that caught me off guard and got me thinking about how I've developed as a person and as a Christian over the past 20 years or so. On both occasions I was shocked to hear the things that were said about me. If you have known me for a long time you may not even believe what I'm about to tell you. So what were these two shocking things that were said to me? It's been a few weeks since I returned from Ahuas, and I've finally finished my highlight video. I hope you'll take a few minutes to watch and learn about my trip to Honduras! Rapid Response: Ahuas, Honduras from Aaron Hammitt on Vimeo. If you prefer still photos, I also put together a photo album on Flickr. In my last post, I talked about the possibility of a rapid response trip to Central America. 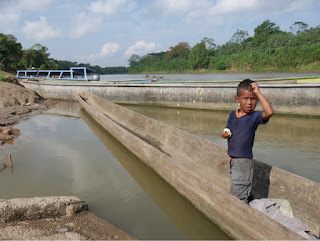 Well, the trip to Ahuas, Honduras did in fact take place; I simply failed to write a blog post before I left for Honduras. Ahuas is located in a remote location in eastern Honduras, in the Miskito (or Mosquitia) region. 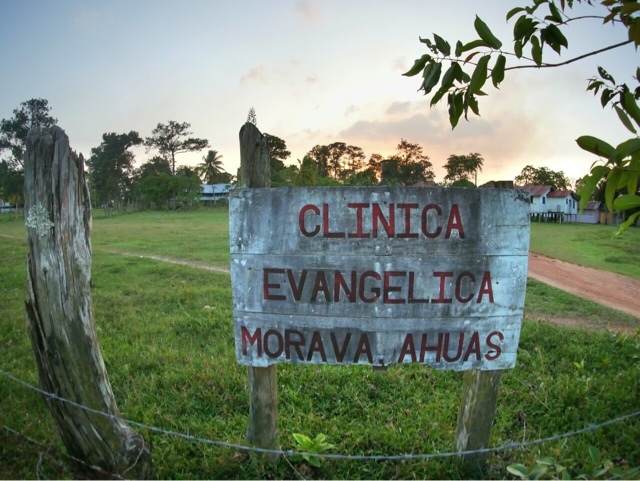 The region is served by a medical clinic (Clinica Evangelica Morava), and the clinic is supported by Alas de Socorro, an organization that provides air transportation to critically ill patients that cannot make the trip by boat. When the airplane is down, patients must get to the clinic by boat. Late last year, Wayne Miller (the pilot for Alas de Socorro) was carrying several patients when his Cessna 206 suddenly struck a buzzard three miles from the airstrip. Fortunately no one was injured, and Wayne was able to make it back to Ahuas. The airplane, however suffered significant damage, including a broken windshield, a crumpled firewall and glare shield, and bent roof skins. Alas de Socorro currently does not have a mechanic that is qualified to repair the airplane, and so air support for the hospital was no longer available. As a result, many residents of nearby villages have been unable to receive the emergency medical care that they needed. 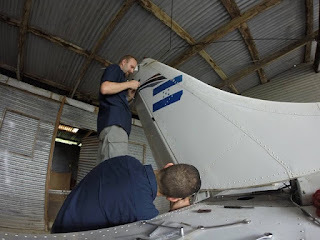 Fortunately, MMS Aviation was able to send a team to repair the damage to the airplane, and I am privileged to be one of three men chosen for the task. 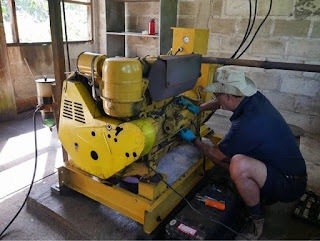 Mike Dunkley and I were here for three weeks, and Jason Maust worked with us for two weeks, having come a week later to bring the additional parts and tools we discovered that we needed during the first few days. The MMS crew with the guys from Alas de Socorro. 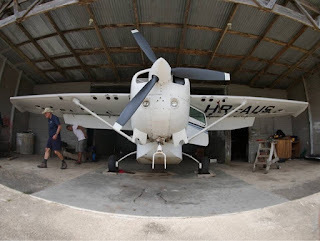 Our plan was to focus on the airplane that had suffered the bird strike (tail number HR-AJW, or "Juliet Whiskey"), and then to shift focus to another Cessna 206, HR-AUS ("Uniform Sierra"). Uniform Sierra was a lower priority, because it is uninsured and will be sold to make room for a turbo 206 that is being donated by another organization later this year. Uniform Sierra was in the middle of a major inspection when work was interrupted, and the inspection was never completed, leaving the airplane unairworthy. Well, it wasn't long before we realized that our plans were being turned upside-down! We knew prior to arriving that the parts to repair Juliet Whiskey were held up, but we fully expected them to clear customs by the end of our first week in Ahuas. After two days spent disassembling Juliet Whiskey, assessing the damage, and requesting additional parts and tools from Jason (who was following us down a week later) we shifted our focus to Uniform Sierra. As it turns out, there was much more to be done than we had anticipated, and Uniform Sierra became our main project while we waited for parts to repair Juliet Whiskey. Jason and I completely disassembled the tail to replace a cracked bracket. Mike replaced the emergency locator transmitter, which included fabricating a new bracket from sheet metal, without the the benefit of basic sheet metal tools. We rigged all of the control systems, replaced control surface bearings, replaced wheel bearings, repaired corroded skins, replaced the throttle cable, removed the throttle body for repair in the US, replaced severely corroded brake lines and other components, removed and cleaned the brake master cylinders and more. By the beginning of the the third week it was becoming clear that we were not going to receive the parts to repair Juliet Whiskey. Even by Honduran standards, the parts sat at the port of entry much longer than anyone expected, and were only released from customs the day we left Ahuas. Even if we had stayed a few extra days (which we were willing to do), we could not have completed the repair in the time allotted. With our remaining time, we cleaned out the parts room, took inventory, and identified parts to be sold or disposed of. Some parts had been there since the late 70s and had either expired or were spares for airplanes that are no longer owned by the mission. Although inventory is not the most enjoyable job, we were able (with Mike's expertise) to clean out old inventory, and identify parts that can be converted into cash for the mission. We will also help them build an inventory appropriate for their current fleet. This was not a job we planned to do, but in doing it we provided a much-needed service to the ministry. As the day of our departure drew near, we were feeling a bit discouraged. Despite all of our efforts—and the prayers of hundreds of people—the clinic still did not have a functional airplane. But into the midst of our discouragement there came a ray of sunshine. One day near the end of our stay we noticed the generator was not running. The hospital gets its power from solar panels, batteries, and diesel generators. However the solar panels and batteries cannot provide enough power for surgeries and sterilizing the surgical equipment; these require the generator to be running. Already, two surgeries had been postponed. To make matters worse, the starter for the backup generator had been sent away for repair just four days earlier. Because we had time to spare we offered to try to fix the generator. Getting the starter installed on the generator. We quickly diagnosed the problem as being the starter. Our first attempt at a repair was unsuccessful, and we realized we would need a replacement part, as the unit was beyond repair. They assured us there were no spare parts in town or on the premises, so we were going to attempt a temporary solution to get a single start the following morning so the surgeries could be performed. But later that night someone remembered an old generator was rusting away in the back corner of a storage building. They pulled it out, and to our amazement it had a Bosch starter, which had seized up but contained the exact component we needed for the repair! The next morning we got to work changing out components, and the starter was installed just thirty minutes before surgeries were scheduled to begin! As it turns out, there were four procedures done that day. We will never know if lives were saved that day, but it was a great blessing to us to be a part of getting the hospital's power back on line so they could continue bringing health, hope, and the love of Christ to the people of La Mosquitia. Some Ahuas residents outside the clinic. 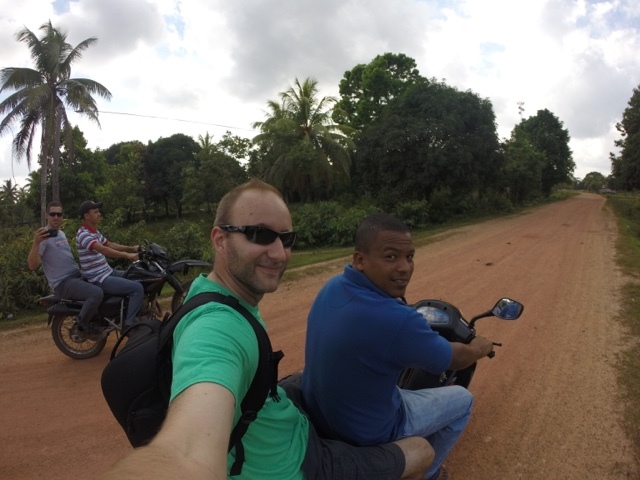 Yesterday we left Ahuas, and today I sit in El Progreso, awaiting our Monday flight home. As I reflect on the past three weeks, I still don't fully understand why God did not answer our prayers for Juliet Whiskey's replacement parts to arrive. Why wouldn't he want the airplane up and running, while so many people need the help that it brings? At the same time, we have seen glimpses of the good in His plan. Because we focused on Uniform Sierra early on, we identified and repaired problems that otherwise may have not been discovered. Because we didn't have parts for the airplane, we had time to fix the generator so that the surgeons could do their work (as important as the airplane is, the generator is even more important to the hospital's operation). And what were the chances that we would find a replacement part in such an obscure place? God was clearly providing in an amazing way. Finally, although inventory and cleaning is not a glamorous task, our work will be extremely valuable for the long term viability of Alas de Socorro's ministry. This trip was a reminder that, although we have our plans and purposes, the more important thing is to walk with the Lord and submit ourselves to His plan—to shape and mold us; to draw us closer to Him; to conform us more and more to the image of Christ; and to minister to others through us, in whatever ways He sees fit. I can rest in the fact that I am just clay in the hands of the Potter who has created me and holds all things in His hands, and who is good in all He does, even when I don't understand. And while airplanes can be an important tool for ministry, ministry is really about people. 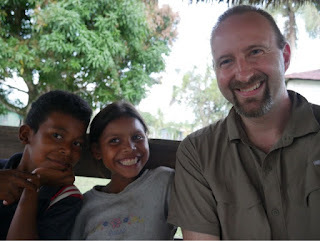 The past three weeks I have been privileged to get to know the Miskito people. They have been a blessing to me, and I pray that through my time in Honduras I was a blessing to them as well. Wayne, the pilot, and Wayli, his right hand man, took us down to the river our last morning in Ahuas. Recently, an airplane operated by a ministry in Central America suffered a bird strike that caused significant damage to the aircraft. They called MMS Aviation to ask if we can come down to make repairs to the airplane and restore it to airworthy condition. We are still working out the details, but I'm excited about the possibility of traveling to Central America to help with this project. Would you pray for wisdom and guidance for those who are assessing the situation and making decisions about how to proceed? Thank you, and I look forward to writing more as our plans take shape!